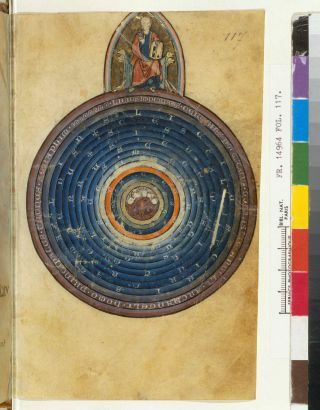 The universe as envisioned in Goussin de Metz' "L'image Du Monde," published in 1245. Bibliothèque Nationale de France, Fr.14964, fol. 117 (reproduced with permission). The idea that our universe may be just one among many out there has intrigued modern cosmologists for some time. But it looks like this "multiverse" concept might actually have appeared, albeit unintentionally, back in the Middle Ages. When scientists analyzed a 13th-century Latin text and applied modern mathematics to it, they found hints that the English philosopher who wrote it in 1225 was already toying with concepts similar to the multiverse. "The results give us a much deeper appreciation of science in the 13th century," said one of the lead authors of the study, physicist Richard Bower of Durham University in the United Kingdom. "From a scientist's perspective, I find I had previously completely underestimated the depth of logical argument in the Middle Ages." The international team first translated the original Latin text — called De Luce, which means "On Light," and written by a philosopher named Robert Grosseteste — into English. Grosseteste was "one of the most dazzling minds of his generation, lauded by his successors as a mathematical genius, theologian, politician and church leader; he was the bishop of Lincoln from 1235-53," said the principal investigator of the research, medieval historian Giles Gasper of Durham University. The scientists then tried to understand what Grosseteste was aiming to explain, and wrote down his ideas as if they were modern mathematical equations. The team used a computer to solve these equations, and to see whether they explained the universe as Grosseteste imagined it. In Grosseteste's time, the dominant cosmological model was the one developed mainly by the Greek philosopher Aristotle. He postulated that there were nine planets (called spheres), one inside the other, with planet Earth at the center. In De Luce, Grosseteste assumed that the universe was born from an explosion that pushed everything, matter and light, out from a single point — an idea that is strikingly similar to the modern Big Bang theory. The crystalized matter, Grosseteste assumed, also radiated a special kind of light, which he called lumen. It radiated inward, gathering up the "imperfect" matter it encountered and piling it up in front, similar to the way shock waves propagate in a supernova explosion. This left behind "perfect" matter that crystallized into another sphere, embedded within the first and also radiating lumen. Eventually, in the center, the remaining imperfect matter formed the core of all the spheres — the Earth. After they ran a computer simulation using modern equations, the researchers found that the universe imagined by Grosseteste indeed could have formed exactly the way he described it. "Amazingly, the computer simulation shows that Grosseteste's description is accurate," Bower said. However, Grosseteste's reasoning only works if there is the right number of properly ordered celestial spheres — and this only happens in the simulations if there are very specific starting points. "On their own, Grosseteste's laws aren't enough to produce the universe he thought he lived in," Bower said. The medieval philosopher realized this problem, too. To deal with it, he added an extra reason to explain why there were "exactly nine celestial spheres plus one, an 'imperfect' Earth," Bower said. Grosseteste's explanation was remarkably similar to the reasoning applied in modern cosmology. Today, the laws of general relativity and quantum mechanics are used to explain the origin of the cosmos, but they do not tell us the amounts of normal matter, dark matter and dark energy in the universe. "To explain this, cosmologists often appeal to some new theory, such as a super-symmetry theory, for example," Bower said. In other words, current models work for only certain specific values, and if the values are chosen at random, the explanation fails. So to satisfy these conditions, some physicists suggest that we, in fact, live in a multiverse — that there is not one universe, but an infinite number of them. In this way, any outcome can be accounted for, if not in ours, then in a neighboring universe. In the same way, if the parameters in Grosseteste's model are modified, there will be a different number of spheres around the Earth. And although De Luce never mentions the term "multiverse," Bower said that Grosseteste "seems to realize that the model does not predict a unique solution, and that there are many possible outcomes. He needs to pick out one universe from all the possibilities." "Robert Grosseteste works in a very similar way to a modern cosmologist, suggesting physical laws based on observations of the world around him, and he then uses these laws to understand how the universe formed," Bower said. Although Grosseteste's description of the origin of the cosmos is not accurate and not based on modern physics, his theory makes sense, and — when one accepts Grosseteste's initial assertions — it is "a logical argument that a modern physicist would be proud of," Bower added. "Personally, it reminds me that in future centuries, a new generation of physicists will look back at how we understand the universe today, and think, 'How could they not see that?'" Bower said. "Modern cosmology is a grasping towards a more complete understanding of creation, but we do not yet see the full picture." The study was funded by the UK's Arts and Humanities Research Council, and is described in more detail on the team's Ordered Universe blog (http://ordered-universe.com). Follow Katia Moskvitch on Twitter @SciTech_Cat. Follow us @Spacedotcom. We're also on Facebookand Google+. Original article on Space.com.